Gondor, Ethiopia, was this once Aragorn's kingdom? Gondor. Is it wrong to be excited about going to a place just because of the name? Probably not. After all, the words Paris or New York exude excitement every time they are uttered… but Gondor? Yes Gondor ‘you fool of a Took’! Don’t you remember that this is the City of Men, rightful throne of Aragorn? If you have no idea what I’m talking about then you obviously don’t know your Lord of the Rings well enough. Now don’t get me wrong. I’m not a massive Tolkien fan. I don’t know Elfish and I’ve never studied the history of the Second Age (the time when the One Ring was forged). But I, like the majority of the English-speaking world, recognise the genius of his work. I love the book and I love the movies and if people travel half way around the world to visit movie sets in New Zealand then I think its perfectly acceptable for me to get excited about the fact that there is a real place in Ethiopia’s historic north called Gondor. Once in Gondor my Lord of the Rings excitement (read obsession) only grew. Gondor is known as the Camelot of sub-Saharan Africa. A Unesco World Heritage Site, the small mountain town is dominated by the long walls of a huge stone castle complex. Inside the complex is a mixture of well-preserved, rebuilt (by the Italians during WW2 when they used Gondor as a military base) and half-crumbling (mostly bombed during WW2) castles perfect for igniting the imagination. Our guide’s well-rehearsed historical recital of the various Kings of Gondor – from the very good, who even gave rights to donkeys, to the very bad, who was obsessed with conquering more and more land – only served to further fire ones innate creativity. My heart actually skipped a beat when we were led up some stairs to be shown the point where a look-out would wait to see the sign of fire warnings from outlying military posts. “Just like Lord of the Rings,” I cried. “Maybe,” he said. But I could see it was without enthusiasm, and with a sense of incredulity that I would associate the two. Here is where I think the tourist industry of Gondor is missing a trick. 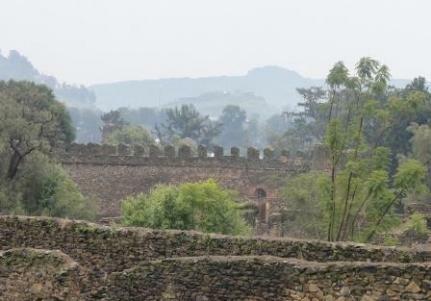 Admittedly Gondor, Ethiopia’s famed capital city before Addis Ababa, chosen after an exhaustive search for a capital beginning with the letters ‘Go’, and with the help of a mythical Lion, has enough of its own rich history and legend to have no need to grab on to a fantasy book from the West. But surely, a once-a-year, week-long Tolkien-fest wouldn’t hurt? Even with my scant knowledge I was constantly finding references to excite. Among Gondor’s beautiful bird life are gorgeous eagles – surely descendents of those same eagles that took part on the side of men in the battle for Middle-Earth. The Queen who was seduced and left (the real) Gondor in turmoil – surely she was under the influence of Saruman. The wonderful wilderness of the Simien Mountains, which lie between the angel-crafted kingdom of Lalibela and Gondor – surely these were once known as the Misty Mountains – those same mountains crossed by the Fellowship of the Ring after leaving the Elfish kingdom of Rivendell. So be it. Even if the Tolkien Tour of Gondor never comes into existence, for us, lovers of Tolkien’s literature and Jackson’s cinema, I think a visit to this beautiful Ethiopian mountain town will always carry an extra something special in the quality of our excitement.